She is going to run for 2017 election in Jakarta Capital Region. She is a vice-governor candidate with Agus Yudhoyono as the governor candidate. This was the third time for me being embedded with Mpok Sylvi. 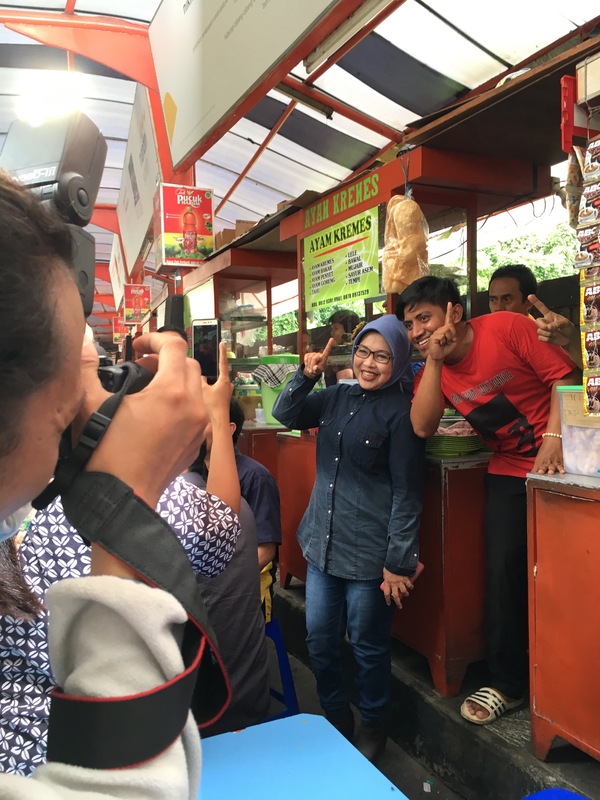 Tuesday afternoon, she was visiting one of culinary spots in Central Jakarta. The place is known as BSM Culinary Site near Jalan Sabang. BSM is a private bank company which cooperates with the local government to develop this culinary centre. Sylvi had a lunch with some guys from BSM, her campaigning team, and some journalists including me. I sat opposite to her. When she finished her ayam bakar, I went to her table and asked her for an interview. I asked her about a topic, which was requested by my editors. Another topic that interesting for me was the history of this culinary site. Another vice – governor candidate with entrepreneurial background Sandiaga Uno had ever mentioned, that he will provide a kind of bridging for coorporate and Jakarta resident in order to develop the grassroot’s economy. “Another candidate was just saying it, I’m proving it”, said Sylvi when I asked her that her vision was also being talked by Mr Uno. I honestly put my appreciation to Mpok Sylvi. In addition to her obvious work and numerous bureaucratic experiences, Sylvi had a noticeable confidence. Some pollings had shown that Agus-Sylvi had the lowest number of popularity compared to Anies – Sandi and Ahok – Djarot. At the national national stage, Sylvi’s figure was also considerably unpopular. Nevertheless, she has been in a great performance, so far – to the extent to the way she communicate both to the public and to the journalist.